One of the most effective and attractive ways of submitting information is infographic. Certainly, the infographic is a very good one for a modern user who perceives visual information but reluctantly finds the time to read. In the modern pace of life, we do not always find the time to read the text. Although it is very important to take and study new information. Probably, that is why many people are happy to perceive infographics. What role does it play in blogging? How to create and use it competently? If you want to develop your blog, you need to use infographic, that’s for sure. People always pay attention to beautiful pictures, especially if they also carry useful information. If you had a choice – read an article or look at infographic on the same topic – what would you prefer? And what would you share with your friends in social networks – a picture with information or text? Most noteworthy, infographic is much easier to understand. That’s why many users will pay attention to your post if it contains infographic. As a result, it will spread faster and will be much more attractive. In addition, it’s not necessary to replace the text with infographic. You can simply supplement it to visually present the information. Above all, a competently made infographic is a pledge of a successful blog. 1. Infographics should consist of solid, large and monochrome elements. You need to delay the user’s attention to a certain topic and information. At the same time, try not to make him confused by seeing dozens of different small elements. 2. Create an “anchor”. 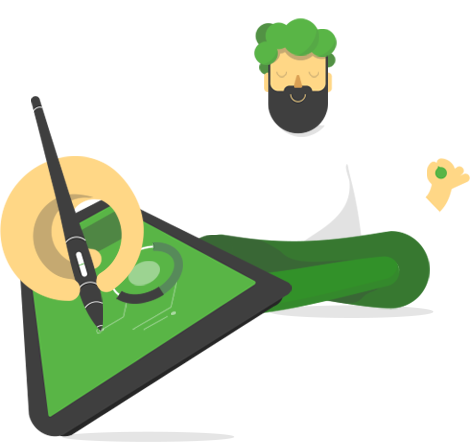 It means creating a piece of infographic that makes it visible and understandable at a glance. In other words, to create something that the eye of a user, who visits your page or your blog, can catch immediately. 3. If the element is optional and serves only for decoration, it is better to remove it. For the reason that it can simply mislead. 4. Use a limited number of colors as the abundance of colors is confusing. It doesn’t allow the user’s eye to concentrate on one thing. 5. Do not be afraid of abstraction. Have you ever wondered why the world prefer an abstract format of maps, rather than a more reliable geographically format? The explanation is very simple: abstract maps allow you to clearly see the routes even at one glance. While the second option has a lot of unnecessary information, in which the necessary data is lost. Now, when we figured out how to correctly create an infographic, taking into account all the nuances, let’s talk about how to start creating your infographic and where to start. The most important thing is to draw up a plan. You must follow it throughout the process. But you should do this after you have collected all the necessary information. First of all, precisely determine the subject of infographic, select all the arguments, draw conclusions, specify all the nuances. Next, select the methods for presenting the information – these can be charts, diagrams, charts, etc. The main thing is that you like it and it is easy to perceive. The next stage, which is also important, is the addition of a company logo or portal. Be sure to designate your company unobtrusively and not catchy, but tastefully. Sometimes you can even post watermarks to protect your work. Furthermore, build causality and draw everything schematically on paper. Visualization is a very important component in this kind of work. In addition, when creating infographic, it is important for you to choose the right colors. For instance, brown is the color of reliability and constancy, and red is the color of importance and priority. Likewise, do not forget that the colors that are not correctly chosen for the infographic will only discourage and annoy the user. • choose the correct colors. Nevertheless, creating an excellent infographic is only half of the success. Another half is to make it effective and in such a way that users can find it easily. It means that you need something to raise the online activity of infographic. For this purpose there is SEO. SEO (search engine optimization) is a sort of Internet marketing strategy (or strategies). So you can read more about how to use it in our article on this topic. Just go this way. Hope this article was very informative and useful for you. Now you realize why infographic is so important for your blog. You also know some secrets and nuances how to create it and why it is important to use correctly created infographic.